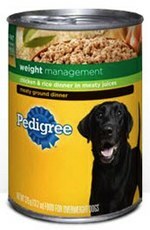 Franklin, Tennessee – On Saturday, June 30, 2012, Mars Petcare US announced a voluntary dog food recall of a limited number of three varieties of Pedigree weight management canned products due to a potential choking risk. 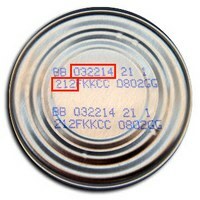 Affected product may contain small pieces of blue plastic — which entered the food during the production process. The source of the plastic has been identified and the issue resolved. Consumers who have purchased affected product are advised to discard the food or return it to the retailer for a full refund. While a small number of consumers have reported finding the plastic pieces, the company claims it has not received any reports of injury or illness associated with the affected product. The lot codes indicated below should not be sold or consumed. Affected product was distributed to retail customers throughout the United States. Mars Petcare US is working with its distributors and retail customers to ensure the recalled products are no longer sold and are removed from inventory. Which Pedigree Dog Foods Are Recalled? Only Pedigree weight management canned dog food varieties with the production codes shown below are included in this voluntary recall. No other Pedigree products are affected, including any other variety of wet food, dry dog food, or dog treats. For questions or more information, the company invites consumers to call 877-720-3335 from 8:00 AM to 7:00 PM CST. Here is a great treat for your dog. Remember to feed in moderation. 2 whole eggs (or egg substitute if your dog is allergic. You can omit, although the loaf may not hold together that well without a binding agent such as eggs). In a large mixing bowl add meat, cottage cheese, veggies, and eggs. Mix thoroughly. Add wheat germ and olive oil, mixing well. Add mixture to loaf pan, bake at 350 for 1 hour or until done. Allow to cool thoroughly then cut into pieces and store unused in airtight container for up to two weeks in the fridge. The Dog Flu, also known as H3N8, also known as Canine Influenza Virus (CIV), is a flu contagious amongst other dogs, it is transmitted through mucous membranes of the infected dog to other dogs. Humans cannot contract this virus. This flu has been found in 30 states and could be spreading. There is a vaccine for this virus, but the vaccine does not mean your dog will not still get the virus, rather, it just lessens the severity of the flu. Usually treatment consists of keeping your dog well hydrated, getting lots of rest and usually this will clear up on its own. If your dog is developing a secondary bacterial infection, which could lead to pneumonia, antibiotics are prescribed. If you think your dog may have this, take them to the vet to make sure they get proper treatment. For more information, this is an article that provides more information on H3N8. Yes it’s true. There is a veterinarian from Florida who has developed a special sunscreen for your furry friend. If you are like me, I like to take Sasha for long walks/jogs daily. I try not to go when the sun is at it warmest point, but there are times that no matter when, the sun is out and it will be hot. Michael Fleck is a veterinarian and esthetician who has developed a product line called Epi-Pet, which is not only sunscreen, but also sprays for skin rashes, and soothing creams for dog noses. His products are F.D.A compliant, which makes them one of the only products out there that adhere to those guidelines for animals. The products should not be used on cats. Do not use regular human sunscreen on dogs, as the ingredients (mainly PABA but others as well) are harmful and potentially fatal to dogs. What made me take notice to this product is that cancer seems to be high on the list of illnesses that kill the most dogs each year. I know it is difficult to prevent any form of cancer, but if I can help even a smidgen, I am going to do all that I can to make sure that I am trying to prevent skin cancer on Sasha. To read more information on why sunscreen is so important to dogs, here is an article that explains things more in depth. If you are looking to buy Epi-Pet, Amazon has some for sale. This cat is so sweet. She was adopted and had aggression issues, but her new pet parent worked with her and now sweet, fluffy Arwen is performing tricks and actually enjoys doing them! I have made posts on clicker training and cats before, but I wanted to add another one as a refresher. You can teach your cat many tricks that dogs learn and even different ones than dogs learn. The trick (pun intended) is that cats respond differently than dogs. More patience and doing tricks before meal times usually get your cat interested in doing what you want them to do. Some cats are afraid of clickers, so sometimes just making the clicking sound with your mouth is sufficient. Without further ado, here is the video of Arwen performing tricks with her pet parent doing clicker sounds with her mouth and treats for the smart cat!